I have been researching the major contaminants that reach into the local groundwater basins around Los Angeles, CA. 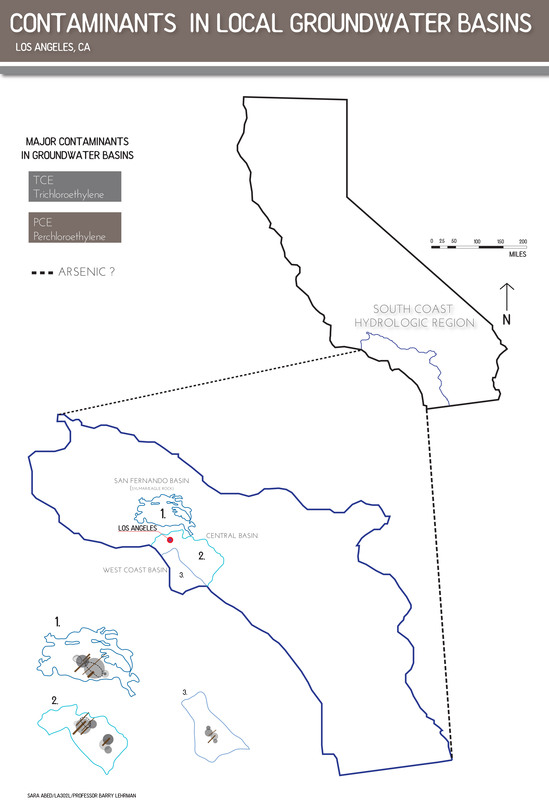 I am looking into the San Fernando Basin, the West Coast Basin, and the Central Basin. After coming across numerous reports on the web, I have found that there are major traces of TCE’s (trichloroethylene) and PCE’s (perchloroethene). TCE’S and PCE’s are industrial solvents. If TCE’s and PCE’S are spilled on the ground, they can move through the soil, into the water underground, and possibly make contact with the drinking water wells. As a result, the drinking water wells may be polluted, thus having the potential to affect our health. During my research, I found some traces of Arsenic in the local groundwater basins, however, the impact there appears to be minimal. What I find interesting is that there are larger concentrations of arsenic found along the Sierras, amongst the geothermal hot springs. Therefore, it is safe to suggest that Arsenic is more or less a ‘natural’ pollutant as opposed to an industrial one. At a regional level, I am continuing to find locations where major sources of Arsenic are present. Further research will be conducted on the pollutants that are found in the contaminated basins (including the water treatments surrounding them) in the Los Angeles area.